Sharon Exley was asked to write about her use of color at Young At Art Museum for an upcoming publication by Sendpoints Publishing Company. This excerpt from the feature demonstrates her sophisticated design approach to bringing this artful museum into full color! 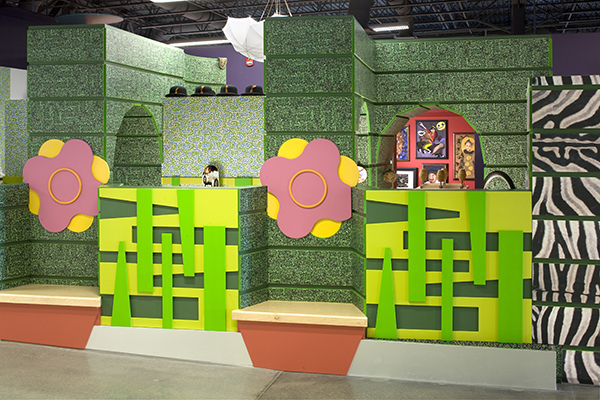 As an art museum for children, Young At Art Museum features 22,000 SF of exhibit space designed by Architecture Is Fun rich in branded environments, art installations, and art-making opportunities. Throughout the museum, there is beauty and the development of aesthetic study. Color enhances each environment with layers of meaning and method. In galleries, color is used symbolically to define and articulate connections to art, history, culture, nature, and wonder. ArtScapes is designed for discovering the continuum of art history and one’s place within it. It features the architecturally significant Cave. 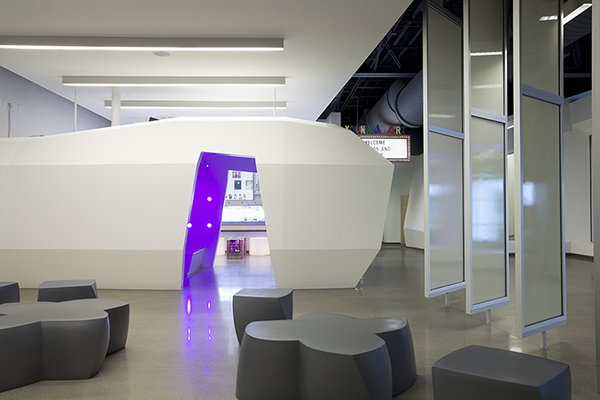 As the first object visitors see, the Cave serves as metaphor, meeting place, orientation theatre, and art-making space. Its column-free structure is faceted and clad with super white, matte surfacing, which contributes to its mysterious nature. 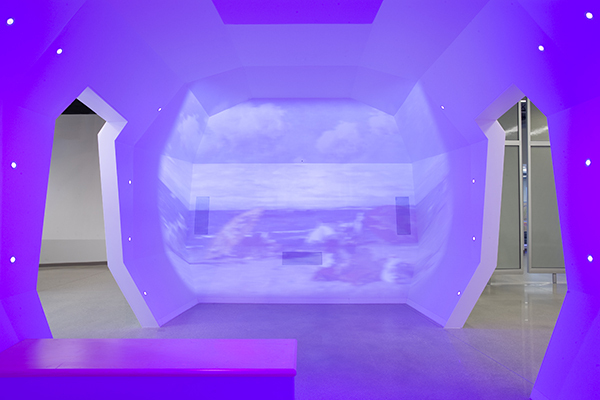 The Cave is a powerful portal of projected imagery and flashing color. 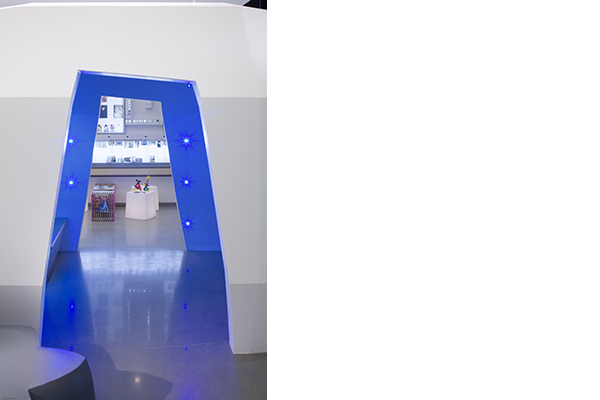 Selecting “museum white” for the cave was an archetypal decision reflecting the modernism prevalent in South Florida. Ideologically, the white form is a cool, modern counterpoint to ancient art. Demonstrating that this is a cave of today, 5,000 years of images of art through history flash through a 4-D flip-book of colors, light, media, and music. 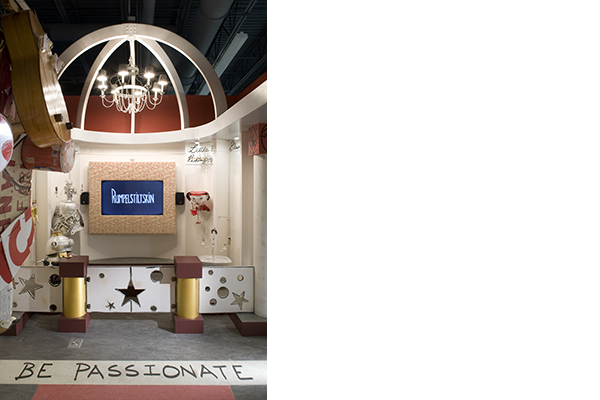 As the very first museum experience, the Cave brands the paradigm-shift of learning about art to using art for learning. Young artists make their mark analogous to the first cave painting and by doing so become part of the journey of art history that flashes on the screen. Visitors explore mark-making as they come to understand art’s capabilities to communicate. A cave panel boasts an image of a Paleolithic Lascaux cave paintings. Prehistoric painters dug minerals and iron oxide from the ground, forming them into crayon-like sticks or liquid pastes resembling paint. The mixing of pigments is found throughout art history, from cave painters to Rembrandt and beyond. 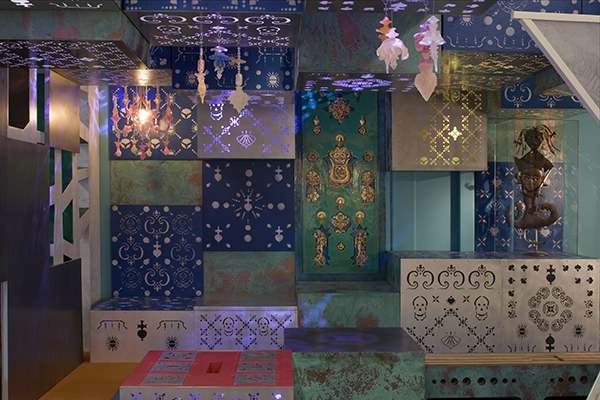 Within the museum, the colors of art’s histories move visitors through time and experience. From the warmth of the Cave, young artists next encounter 10,000 Slides, curating their own collections and the Portrait Gallery, where portraiture is encouraged in an environment paying homage to nineteenth century art salons. The design is particularly referential to the elegance of Sir John Soane’s Dulwich College Picture Gallery, a purpose-built space for viewing art. 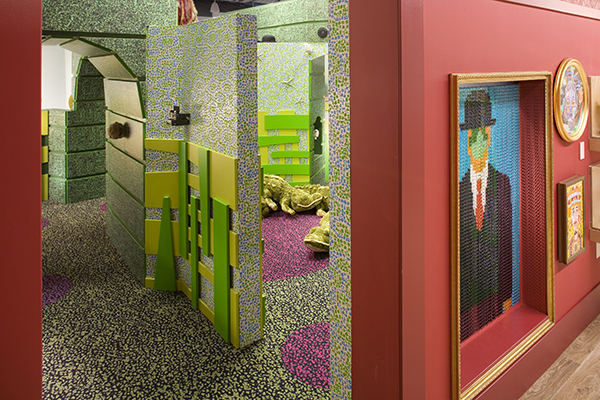 Soane’s fearlessness about using strong color is employed within this children’s gallery of looking and art-making. “Dulwich-red” permeates the patterned wallcoverings, tufted salon sofa, and vividly painted walls, focusing attention and layering views, creating atmosphere, richness and beauty. 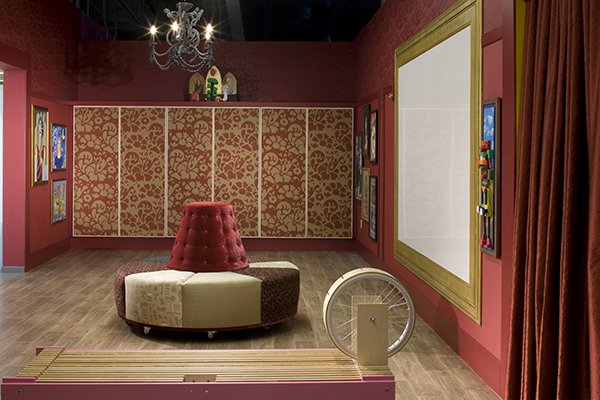 Within this Portrait Gallery, color is the element that creates a branded realism with powerful art-making experiences. In terms of artist colors, the 18th century was the turning point between traditional Renaissance color palettes and the newness of the modern era. 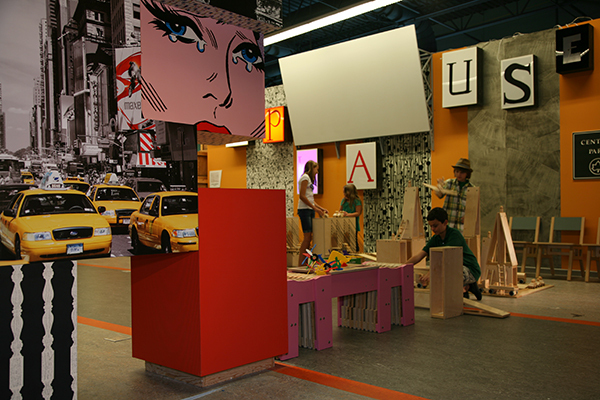 Within the museum adventure, DreamScapes beckons young visitors, who turn and wind their way through a Dadaist and Surrealist maze. Warping perspectives, unexpected color combinations, ready-mades, and wallpapers with dancing symbols challenge perception and surprise visitors with unexpected thought, art-making, and beauty. Exploring the activism and urban expressionism of Avenue A, Pop Art replaces Dada’s satirical elements with clear lines, mass culture, and Warhol-esque advertising. Riding on the subway, chalking Haring-like symbols, engineering the Brooklyn Bridge, and graffiti tagging are part of the modern art movement and bursting pops of color that children take part in. From antiquity to the present day, color has been embedded with cultural meaning. The Archeology Gallery has a richness of color that looks back to the polychromatic colors found in classical architecture. In CultureScapes, environments focus on contemporary global artists, whose art and color palettes are influenced by cultural traditions. The journey through CultureScapes sets off with a 20 ft. tall wave climber, inspired by the Japanese master printmaker Hokusai and his masterpiece The Great Wave off Kanagawa. A sea of blue-green waves contrasts an Origami-covered folded boat, where white-capped waves mark the height of a child’s climb. Collaborating closely with Haitian artist Edouard Duval Carrié, the design team represented his warm and glowing spirit through color, light, and stencils. 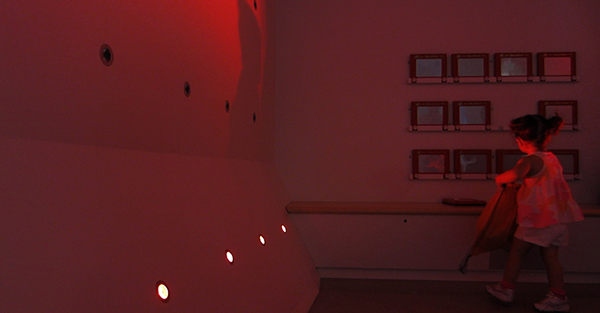 Cuban muralist Leonel Matheu inspired an interactive mural that changes color seasonally and Japanese artist Kenichi Yokono encouraged a printmaker’s palette of ink red and black contrasting sharply with traditional and modern elements: muted rice papers, Manga-like wallcoverings and the bold lacquered head of a Kokeshi Doll, large enough to play within. Art-making and color palettes align within CultureScapes, celebrating and forging understandings of our diverse world. GreenScapes links art and nature by offering choices and activities to reconnect, respect, and responsibly care for the environment. GreenScapes calls attention to environmental issues and the interrelationship of art and earth’s resources. As the color green symbolizes both nature and hope, a palette grew from natural, organic, recycled and found materials. Sandscapes draws inspiration from notable Land Artists, offering hands-on explorations using the land and natural materials for creative expression. Pablo’s Magical Workshop & Theater brings to life the imaginative marionettes Cuban-born artist Pablo Cano constructs from recycled materials and found objects. 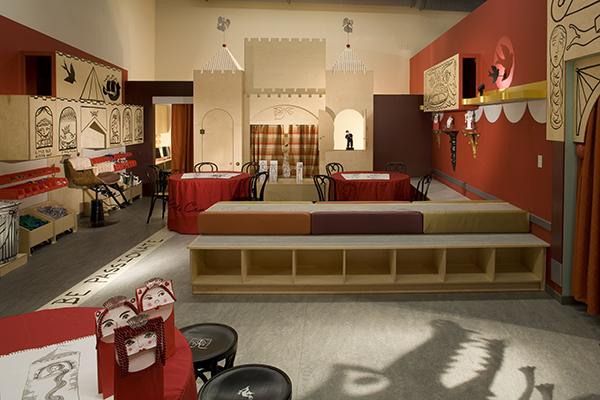 Within the workshop, children create their own puppets and shows. STOMP entices children to perform and make music from discarded objects and join in the rhythms and energy made popular by the world famous touring ensemble. The colors of GreenScapes are lifted directly from the natural environment as well as our rich everyday consumer oriented lives; its colors are found in the materiality and understanding of responsible use. 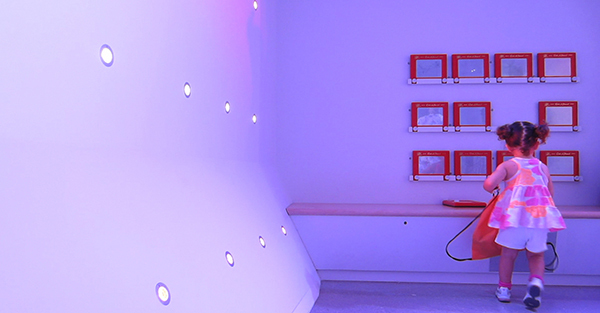 WonderScapes, is an artful journey of play and literacy for children from birth to age 4. 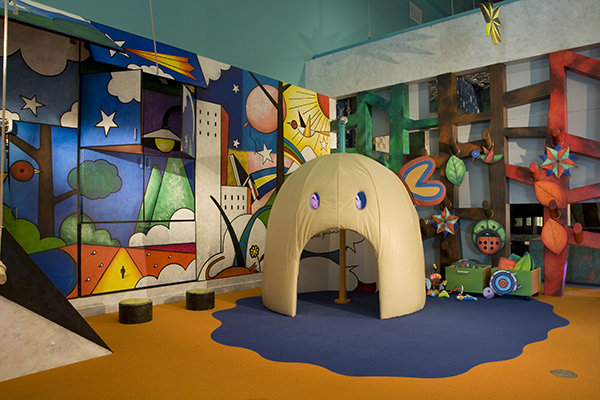 The design team took inspiration from the poetic vision of the award-winning illustrator DeLoss McGraw, adding in shine, shimmer, high contrast, tactile and sensorial materials; all of which add vibrancy and delight to a world for early childhood learning and play. 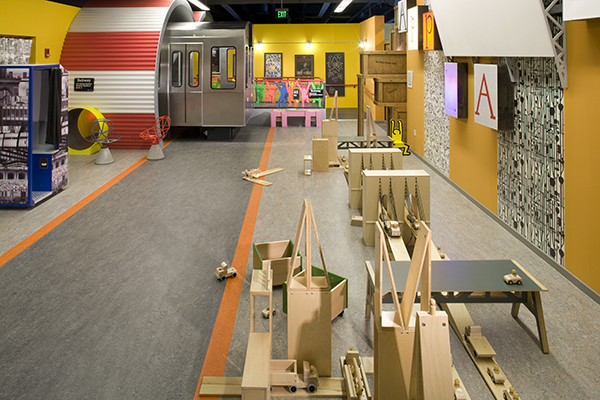 The experiences and environments at Young At Art are a new children’s museum model. They are color-enhanced, sophisticated enough for adults to enjoy, and layered with meaning and experience for artists of all ages.